We have been involved with the buying and selling of homes in Bel Air, Harford County and adjacent areas of Baltimore County and Cecil County for over 15 years. 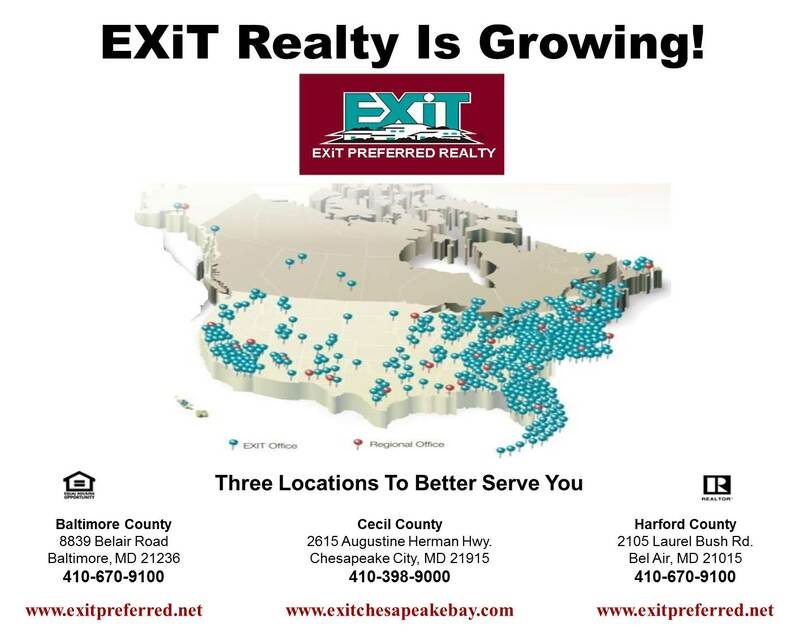 At EXIT Preferred Realty, we pride ourselves at being an important part of the local community and we will continue to serve all of the area's real estate needs for years to come. We have over 20 agents in the office working under an experienced licensed broker. Our Realtors are quality professionals with varied experience and knowledge about all aspects of the Real Estate process. We are technologically savvy Agents have a Digital Marketing Plan to sell your Home. Our agents come from diverse backgrounds but all are dedicated to providing the highest quality service to our clients. Meet Our Agents! We are a fully equipped with a modern group computers and communication systems. We have access to the regional Multiple Listing Service, Public Record Searches, and many other tools and services that our agents use to better serve you.